Turin is an Italian city located in the Piedmont region of north-west. It has just under 900 000 inhabitants and is crossed by the Po, with the Alps in the background. 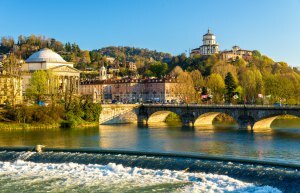 Having experienced a strong economic development after World War II, Turin also won more and more success as a tourist destination. She was joined by air through the airport Sandro Pertini, 16 km from the center, but also by train or motorway. In the city, there is a good tram network, and a subway line. For the traveler in Turin's varied heritage, its vibrant cultural life and its museums, and the historic center where stand many Baroque buildings. We admire the arches are buildings such as the Palazzo Reale, lawns and small wood of the Parco del Valentino, Piazza San Carlo in the heart of the city, with its two baroque churches, Piazza Castello, where stand the church of San Lorenzo and the Duomo di San Giovanni Battista, but especially the Palazzo Madama, the eclectic architecture, which absolutely must see the stairs of Filippo Juvarra, baroque treasure from the 18th century. Side museums, do not miss the Egyptian Museum (which, for Egypt, comes immediately after Cairo) and the Gallery of Savoy (Italian and Flemish painting). Finally, to fully appreciate the art of living in Turin, enjoy an aperitif in one of the bars in town in the early evening and revel buffet (served at will) cheeses, olives, breadsticks and other meats .. .